Allow chilling and freezing time for this iced dessert. For the chocolate sorbet, pour 450ml boiling water into a bowl with the cocoa, sugar and vanilla. Stir until the sugar has dissolved. Immediately add the chocolate; leave for 2 minutes, then stir until melted. Cool, then chill. 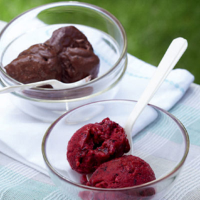 Once ice-cold, churn in an ice-cream maker, following the manufacturer’s instructions, or freeze in a shallow container, blending every 2 hours, until set to a smooth sorbet. Freeze. For the berry sorbet, dissolve the sugar in 150ml boiling water, cool, then chill until ice-cold. Whiz in a blender or food processor with the remaining ingredients to a thick purée. Spoon into a shallow container, cover and freeze. 3 Remove from the freezer 5 minutes before serving.